TyreLAND's South Island Commercial Branches offer a 24-hour onsite emergency service to reduce the stress and inconvenience when your vehicle gets a puncture or tyre damage. If you can’t get the vehicle to us, TyreLAND will come to you and do the repairs on site. VIP customers have no fear of getting stuck with a puncture or tyre damage. All they have to do is phone TyreLAND’s 24-hour freephone number and we will be right there, any time of the day or night. A charge for distance travelled, time and any material costs applies. Phone 0800-4-TREAD or 0800-487-323. TyreLAND deliver a full on-site service for our ‘heavyweight’ haulage and contracting clients. Our highly trained staff have the skill, specialist tools and safety programme to repair trucks, trailers and heavy earthmover vehicles. Phone 0800-4-TREAD or 0800-487-323. When the wheels grind to a halt on the farm, TyreLAND will be there to repair or replace all manner of tractor, truck and machinery tyres. 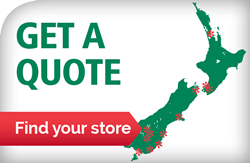 Service offered from our rural service centres of Blenheim, Christchurch, Oamaru, Wanaka, Cromwell, Alexandra, Dunedin and Invercargill. A charge for distance travelled, time and any material costs applies. TyreLAND accepts CRT and Farmlands Cards as a good way of doing business. Phone 0800-4-TREAD or 0800-487-323. TyreLAND deliver full fleet service for commercial customers including fleet checks/pressure checks, puncture repairs, tyre rotations, re-torqueing and tyre replacement where necessary. Please discuss your fleet service requirements with your local TyreLAND branch who can also coordinate your fleet servicing throughout the South Island. Phone 0800-4-TREAD or 0800-487-323.